The early history of London is perhaps one of the least talked about areas of London's amazing history. But at the Museum of London they have put aside a special gallery called London before London which covers the period of time when the Thames basin was simply a wilderness. This time period in London's history is rich with ancient meanings from the small communities who farmed and hunted the area at the time. Every hill and curve of the river held special significance to these peoples and it is this gallery which seeks to explore and uncover these hidden meanings. Changes to the Landscape caused by climate change and early human involvement. The importance of the river regarding communication, power and offerings during this time. The dynamics of the people of the time and how many great changes occurred. 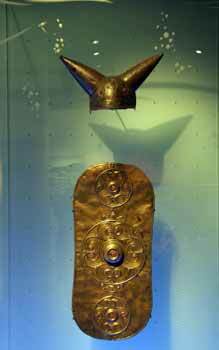 The story of the Thames valley between 450,000 years ago until 43Ad when the roman's arrived in Britain. The Thames Valley was constantly changing at this time due to climate change. ice sheets carved through the land and the river and the land masses were changing shape and size. Different animals and communities roamed the landscape at different times and many animal bones have been found to indicate the shape of the land at the time. 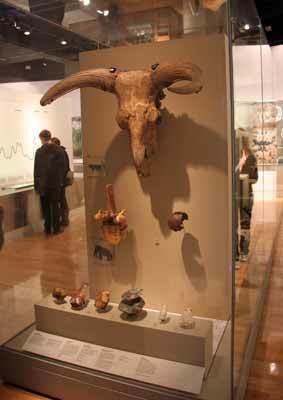 One of the most impressive items on display is a huge Auroch skull with antlers which was discovered with many other animal remains in a pit in Ilford, which in the Thames valley running towards the east coast. An Auroch was a wild ox which is now extinct and this particular Auroch was believed to have been drowned by a sudden flood possibly caused by melting ice sheets or land shifts. 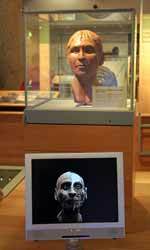 One of the more captivating objects in this gallery is the reconstructed head of a prehistoric woman whose remains were found at a place called Shepperton along the Tames Valley. From her skull a reconstruction has been made of what she may have looked like. A constantly running film shows how this process was carried out and which a short clip can be seen in this video. 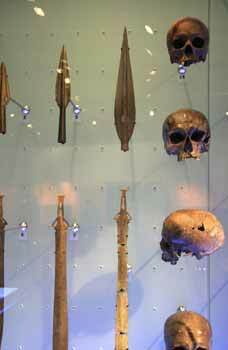 The River Thames which include over 300 objects which have been found in the river. These two images show items which have been found in the river Thames and which date back to this time period. The landscape wall, an area displaying images and poetry, plans for archaeological digs depicting the continuous changes made and being made to the landscape. The early history of London is facinating and this galelry really does bring it to life and make it feel real.